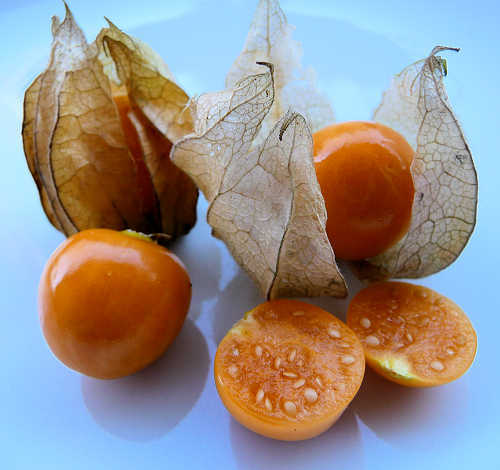 A member of the Solanaceae family, Golden Berry is closely related to Physalis ixocarpa, tomatillo, Physalis pubescens, the ground cherry or husk tomato, and Physalis philadelphica, the Mexican groundcherry. It is more distantly related to potato, tomato, chili pepper, and other nightshades. A Golden Berry's flavor is said to be a cross between tomato and pineapple. Form: An herb with vine-like tendencies that gradually becomes a soft-wooded shrub over several years. Lifespan: An annual in temperate climates, perennial in the tropics. Mature Size: 3-6' high. This plant needs to be supported like a tomato. 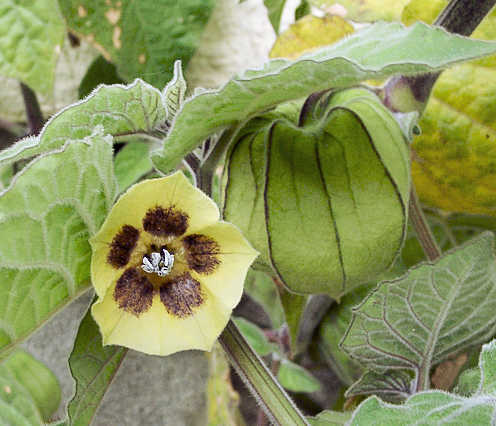 Flowers: Slightly cupped, yellow, with five large brown spots around the center. The calyx grows to surround the developing fruit with a large papery brown husk. Bloom: Spring until late fall or first frost. Self-fruitful: Yes. A light tap on the stem just behind the flower will cause pollination. These flowers are wind and insect pollinated. Fruit: Enclosed in a brown papery husk, they resemble a cherry tomato, with smooth, waxy, yellow to orange skin. The taste is a sweet-tart cross between tomato and pineapple, which varies by cultivar. Fruit size is somewhat variable. One plant may produce 150 to 300 fruit in poor soil, less in enriched soil. Months for fruit to ripen: 2.5 to 3. The fruit will finish ripening if picked green, but will not be as sweet as when vine ripened. The fruit often drop to the ground before fully ripe. Storage after harvest: 30-45 days at room temperature if left dry in brown, papery husk. Several months if refrigerated dry. Leaves: Green, large, broad, with irregularly toothed margins, fuzzy. Named cultivars are not yet sold in the United States. Origin: Tropical Chile and Peru. 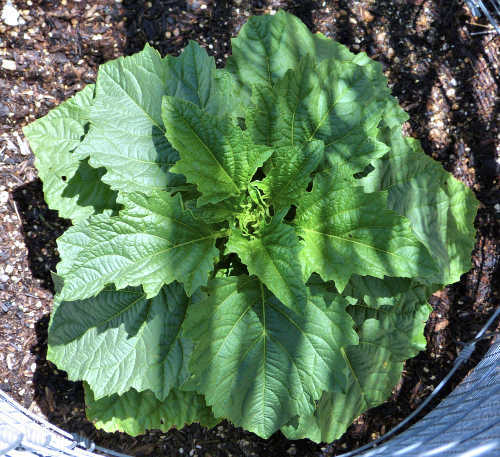 Heat tolerant: This plant needs extensive shade in temperatures above 85°F and extra water. Its normal temperature range is 55-64°F in the tropics. Sun: Before mid-spring, full sun in temperatures below 80°F, 50% afternoon shade otherwise. From mid-spring, 50-80% all day shade in temperatures above 85°F. Water after becoming established: Daily. Soil: Well drained, sandy, low organic content, pH 4.5-8.2 (strongly acidic to moderately alkaline). Fertilize: No. Any nitrogen results in more foliage and less fruit. Mulch: Yes, to keep roots cool and retain moisture. Planting: Can be grown in large containers. May need protection from winds. A plastic shelter can be used to protect from light frosts. Pests: Many insect species attack this plant. Small mammals may browse the leaves or the entire plant. Uses: Fruit, eaten fresh, cooked with apples and ginger as dessert, made into a sauce or jam, or dried like a raisin. Dried fruit is often served chocolate-coated. This plant is cultivated like a tomato except  poor soil works better than enriched, and  it needs all day part shade in high temperatures after mid-spring. It is invasive in tropical climates like Hawaii and Florida.